Small-angle X-ray scattering (SAXS) is used to measure the elastic scattering from a material over an angular range of ca. 0.05 – 5°. These scattering profiles can be used to determine information about the sizes and shapes of these structures as well as the average distance between them. The ranges of sizes or distances that can be determined are typically on the order of a few to tens of nanometers (maximum for our instrument is around 80 nm) and the samples can be liquid or solid in nature. Typical examples of the types of information that can be determined include: the size and shape of nanoparticles, polymers, proteins or micelles in solution; measurements of pore size and inter-pore spacing in mesoporous materials; characteristic length scales in partially ordered systems, e.g. block copolymers composites and gels; and interparticle interactions in colloidal dispersions. Hence SAXS has many applications in the fields of structural biology, chemistry, physics and engineering and sample types: e.g. polymers, pharmaceuticals, cosmetics, foods, catalysts, coal, membranes, and proteins. 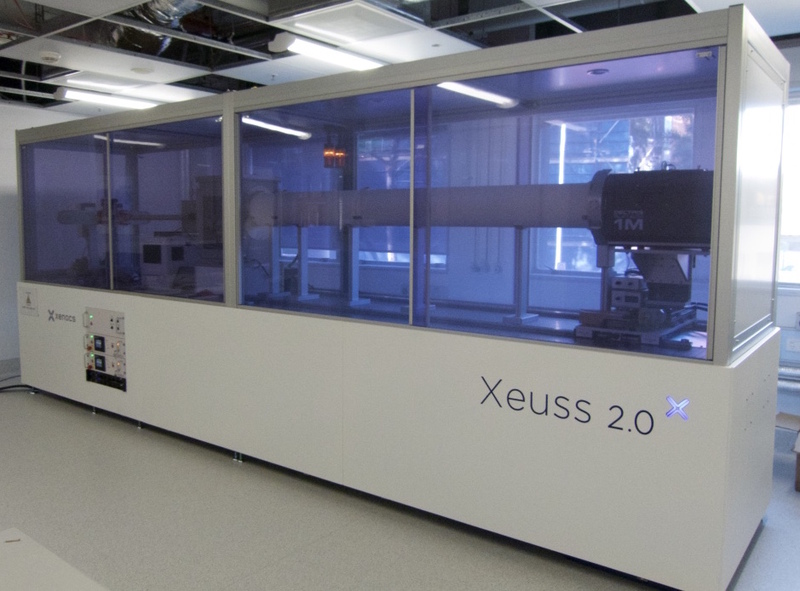 The SAXS instrument within CMM is a Xenocs Xeuss 2.0 system which is equipped with a movable (from a few cm up to 2.5 m) Pilatus 1M detector for SAXS and a fixed Pilatus 100k detector for simultaneous WAXS measurements. The system can switch between a mico-focused Cu and Mo X-ray energies in a pinhole geometry allowing for high resolution studies of materials. It is able to measure a variety of sample types including liquid dispersions, films and finely ground powders in transmission and thin films in GI-SAXS geometry. A range of peripheral devices also allow for the measurement of samples over a range of temperature; ca. -150 to 1000 °C (note: that not all geometries and sample types are compatible with all temperature ranges), in humid environments, and during tensile straining. The system is also equipped with a liquid handling system to allow for high throughput measurement of protein samples.